South Coast College, a little niche college in Orange, CA, surprisingly produces an amazing number of entrepreneurs primarily because of the programs that it offers (court reporting, paralegal, and medical assistant), and the assistance it gives to students to develop their entrepreneurial skills. What is more amazing is that these alumni return to share their expertise on an ongoing basis with the students, faculty, and staff of the college. 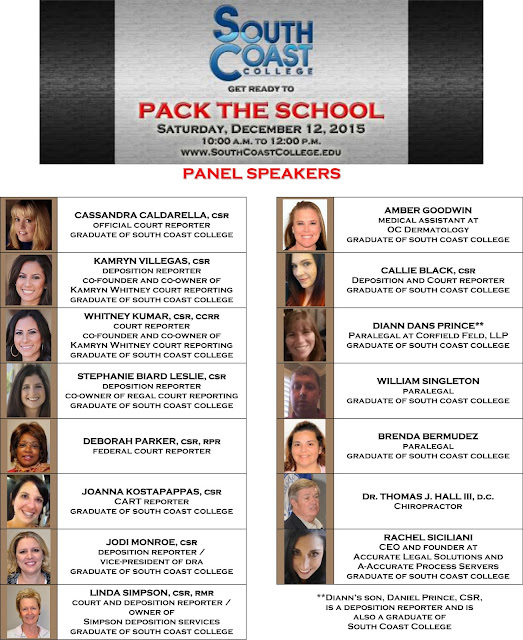 South Coast College was lucky to have some of these people recently at its symposium in December. The alumni who attended consisted of court reporting agency owners, the author of the Lifehacker article on court reporting, and a paralegal graduate who owns a paralegal agency. The court reporting program is a natural for entrepreneurship because court and deposition reporters often start out as independent contractors and build relationships to where they are able to start their own agencies. In this symposium, a number of the alumni who spoke began that way. Stephanie Leslie, CSR, began as a deposition reporter. She and her husband, Isaiah Leslie, decided to expand to enable Stephanie to have a family and to not report as much. Together they established one of the leading court reporting firms in Orange County, Regal Court Reporters. The very popular Valadez twins established their reputations as great reporters in distinct fields. Whitney became an Official Court Reporting in Los Angeles reporting many of the high-profile cases, including: the McCourt divorce trial, trials of Mel Gibson, Brittany Spears, and others. Kamryn became a sought-after deposition reporter. Eventually, they decided to join forces and create their own agency, Kamryn Whitney Court Reporting. Linda Simpson, CSR, RPR, is well known in the legal community and has for over 20 years owned her own court reporting agency in Orange, CA, called Simpson Reporting. The Paralegal Program is another natural for entrepreneurship because many paralegals also work as independent contractors who then branch out and start their own agencies. One of the latest to do so was our recent alumna, Rachel Siciliani, who is CEO of two paralegal agencies: Accurate Legal Solutions and A-Accurate Process Servers. Although this time, there were no medical assistants who had their own businesses, many of the medical assistants have gone on to provide health-care services businesses or other-related businesses. A recent graduate, Araceli Lopez,, opened her own ultrasound business called SneakaPeek Baby.